At the foundation of Esri’s work are the belief and vision that geography is a science that creates a better understanding of our world. Using GIS, geography has also become a unifying framework for integrating many forms of digital information. GIS has now become an important technology in almost every field, improving efficiency, communication, and decision making. 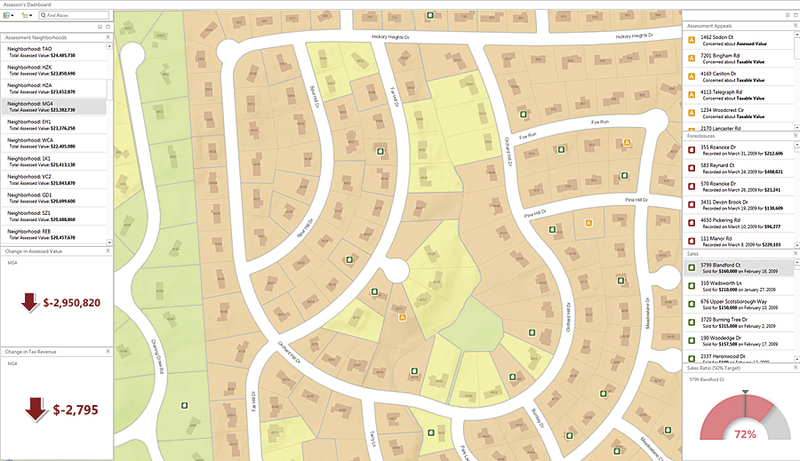 Our users have made GIS come alive in countless applications across thousands of organizations. I would like to both acknowledge and thank our users and partners for supporting Esri’s mission of evolving our GIS technology. Several years ago, we initiated an ambitious effort to both simplify the use of ArcGIS and transform it into a platform technology for use across organizations and the geospatial community at large. The initial release of these efforts was launched last summer in the form of ArcGIS 10.1 and ArcGIS Online. This initial effort is now being continuously upgraded by a dedicated engineering team with the ambition of fundamentally transforming GIS and how people use it. This new generation of our technology has been embraced by thousands of organizations and is already providing great value to our users in their efforts to leverage maps and geographic knowledge across their institutions and beyond. Operations Dashboard for ArcGIS showing a parcel assessor view of property valuation and transactions. While there are literally thousands of technical features that characterize this platform, I would like to begin by sharing our intent and what we believe ArcGIS as a platform means. These efforts will allow our users to better understand the big changes taking place and to take advantage of our work. ArcGIS as a Platform—What Is It? ArcGIS Online is an entirely new part of ArcGIS and extends ArcGIS into a platform, providing both online mapping/geographic analysis, as well as enterprise portal and geospatial content management. It complements and extends on-premises ArcGIS resources by providing cloud computing, as well as rich content and services. ArcGIS as a platform provides open geospatial capabilities to any user and allows access by any application on any device anywhere, anytime. A new concept of dynamic web maps is a central aspect of this platform and facilitates the organization, sharing, and use of geospatial content, maps, and data within groups and across divisions of an organization, as well as between organizations and the public. ArcGIS also includes a large library of applications and templates that are used to access and apply this content in multiple settings, including mobile, tablet, and desktop environments. Over the last four decades, Esri has evolved both its business model and technology offerings through four distinct phases always focused on GIS software services and support. In the early years (1969 to 1980), Esri applied GIS as services work. These were largely GIS-based planning, engineering, and environmental projects. We used our own custom software to carry out hundreds of mapping and geographic analysis projects at scales ranging from small sites to global analysis. The evolution of ArcGIS as a platform. 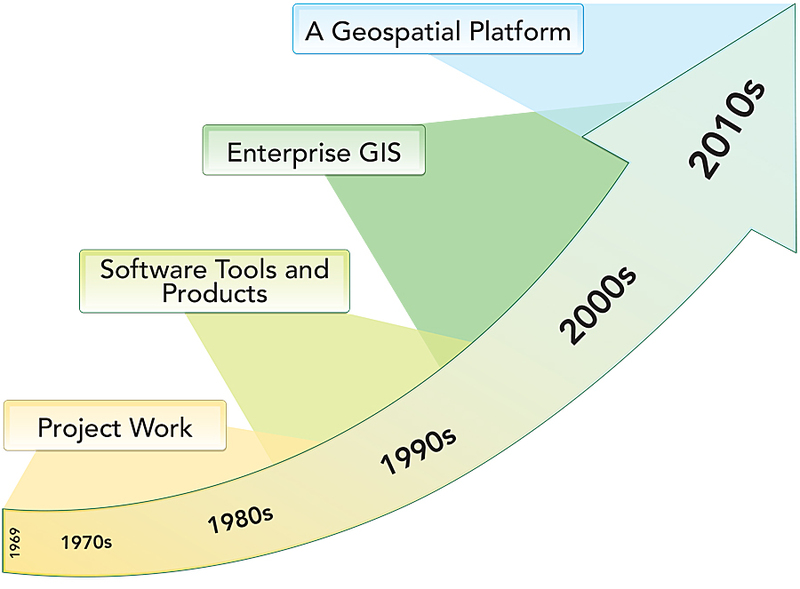 In the 1980s and 1990s, Esri’s focus shifted dramatically toward developing and disseminating generic GIS software tools and products. Our work centered on developing software products that enabled users to do their own applications and build full GIS systems. We also provided technical and educational support and implementation services and developed a robust partner network that resulted in our partners being technical and marketing leaders in their fields. Over the last 15 years, Esri has focused on extending our products to support enterprise GIS implementations. This entailed expanding the capabilities of our products, adding enterprise licensing and support services, and providing new solution architecture needed to support enterprise-scale systems. The next big step has involved transforming ArcGIS into a geospatial platform. This is a dramatic shift and a major turning point for both our users and Esri itself. One of the exciting parts of this shift is the huge opportunity this architecture provides our users. It is also worth noting that the engineering we have done ensures that the technologies that our existing users employ (desktop, server, databases, etc.) are fully integrated. The new platform has the effect of integrating existing deployments into a system of custom, leveragable, systemic resources. ArcGIS as a platform leverages web and cloud patterns using an SaaS business model. It provides a place for sharing user content, as well as a large library of ready-to-use basemaps and geospatial services as part of the platform. Finally, the platform supports many easy-to-use applications, including self-service mapping and ready-to-use templates that support individuals, organizations, governments, and developers. One of the primary drivers of the ArcGIS as a platform initiative has been making GIS easier not only for new users but for advanced users, as well. In addition, the platform is open, extendable, and can be leveraged by others, facilitating both the integration of other geospatial technologies, as well as other enterprise IT and web services of many origins. ArcGIS for Organizations—Professionals can use the platform for mapping, geographic analysis, and data management and sharing. The new ArcGIS Online framework enables organizations to easily share their information in a common environment while respecting the emerging policies and interests of providing open data. This technology has been carefully designed to integrate with traditional GIS workflows, as well as non-GIS geospatial systems. This includes users who wish to enable geospatial access across organizations with common platform technology, sharing services, content, applications, and related know-how. Over the last two decades, geospatial professionals have expressed this vision as a spatial data infrastructure (SDI). The ArcGIS platform allows the SDI vision to come alive with modern cloud/web architecture and, at the same time, integrate and respect the policy initiatives of governments around the world. ArcGIS for Developers—Developers can use the platform to leverage its content and services to make their own applications and services that embed or interact with the core ArcGIS platform capabilities. Developers can extend the system into new areas and provide new focused workflows and tools for GIS and non-GIS users. We believe that enabling developers on the ArcGIS platform will be important to all our users. ArcGIS for Location Analytics—Businesses and IT organizations can use the platform to integrate mapping and geospatial analysis into business systems (e.g., BI, ERP, CRM). We call this ArcGIS for Location Analytics. In 2013, Esri is also focusing on the direct integration of the ArcGIS platform with a number of business system technologies. These include Microsoft Office and SharePoint and business intelligence solutions from IBM Cognos, MicroStrategy, and SAP. This integration is transforming the applications of GIS into other dimensions of IT within organizations. This technology pattern not only allows anyone in an organization to easily make maps with their business data but also supports the integration of traditional business data with the other types of GIS information traditionally housed within GIS organizations. 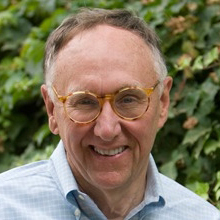 Moving forward, Esri will focus on four major areas: enterprise, online, applications, and developers. The first and foremost direction of Esri will be to continue incremental releases of its enterprise technologies (desktop, server, etc.). With respect to desktop improvements, the upcoming releases will continue to take advantage of the most modern computing advances in the desktop/Windows space and add new features and make quality and functional enhancements in mapping 3D visualization and analysis. ArcGIS for Server technology has been extensively modernized at 10.1 but will continue to be advanced with new enhancements that support private clouds, big data, servers, networks, dynamic image processing, and other real-time streaming data. These and other improvements will be made available in a series of incremental releases every three to six months over the next few years. The second major development direction involves the evolution and extension of ArcGIS Online. This cloud GIS environment is rapidly expanding in both capabilities and use. Today, users have created and shared more than 1 million maps, datasets, and applications and are creating more than 100 million online maps every day. This success is based and built on a large set of foundation mapping and content capabilities that are being extended with spatial analysis this spring. We also continue to add and improve our basemaps and content for our users to exploit, including imagery and geodemographic data, as well as related online services for geocoding, routing, and geographic analysis. For traditional users, it is envisioned that these online services will both complement and extend the work they do on premises at our user sites. This is bringing GIS to a whole new community that uses only ArcGIS Online via web clients and mobile devices. Our third focus is the release of a new family of applications. These applications are easily configurable and support generic categories of geocentric work (e.g., data entry and editing, mapping, spatial analysis, geodesign, and 3D visualization). These applications are part of ArcGIS and will allow users to leverage not only the information contained in ArcGIS Online but also distributed services located in on-premises servers, both in our customer base and from our partners. Our final focus is on enabling developers to build applications and extend our system. Developers can leverage our tools to extend our applications, but they are also building new applications for the desktop, mobile devices, and web browsers. These applications both enable traditional GIS work and open up whole new opportunities to geoenable other systems, providing location awareness or a map-based paradigm for understanding information. Esri continues to support the leading development patterns (HTML5, WPF, .NET, Java, and others) and platforms, giving developers the choices they require. Key to the success of any platform is the adherence to open standards, and Esri has aggressively done this with its implementation of ArcGIS. Over the years, we have spent millions of dollars to ensure that our products support both geospatial, developer, and IT standards. In addition, Esri has worked closely with the Open Geospatial Consortium, Inc. (OGC), for many years and remains one of its largest supporters, integrating its standards into our base platform. We are also working closely with the ISO and WWW communities so that our product suite remains standards based across the IT and web worlds. ArcGIS is a platform for sharing geospatial intelligence around the world. Looking to the future, we see our platform strategy as being of great benefit and value to our users, partners, developers, and ultimately the world itself. It is already creating an ecosystem and community of GIS users who are leveraging each other’s resources and knowledge. Let me conclude by saying that I appreciate the support of our user community. My sense is that this generation of technology will radically expand the world’s awareness and appreciation of geographic knowledge. I am certain that this will make a difference on many fronts, and I welcome the opportunity to continue collaborating with our ecosystem and community of users around the world.